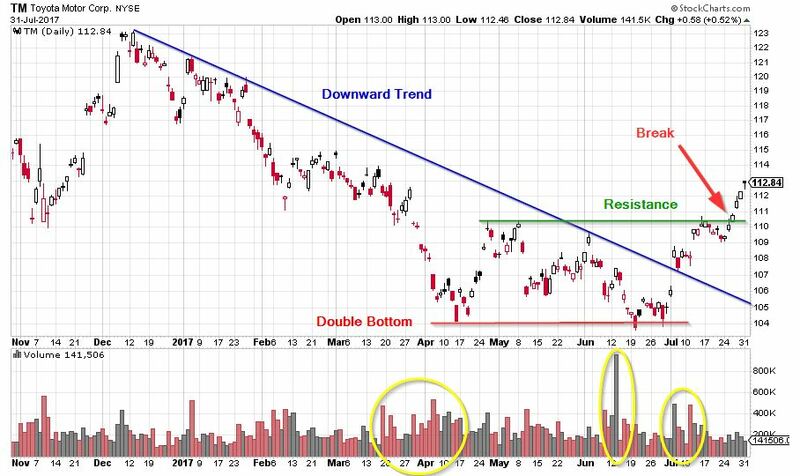 Double Bottom is a reversal chart pattern used by technical analysts to spot a bullish opportunity after an underlying security price made its two lows on the same level. The entire pattern resembles a letter W.
First of all, there must be a prior downward trend until it hits it’s the bottom and starts to consolidate. The consolidation may be spiky or oval, both count, however rather wider the bottoms sing for better performance. Then the price reverses and forms a pattern’s peak which usually goes by 15% on average. Sometimes, there might be something like a second peak as is the case below with Toyota Motors. In such formations, the higher peak is considered as a peak and the lower one is just an early enthusiasm of traders, if this heap worked out, then the double bottom pattern would not form at all. Right after that, there is a decrease back to the same level as the first bottom. This point can vary from the first one up to 5% max., however, in most of the cases, the market participants manage to stop it at the very exact price or up to 2%. The second bottom also can be spiky or oval and again, more oval it is, more performance can be expected. The valleys can differ in the shape, one can be oval and the other spiky – this is still fine with the pattern fulfillment. Once the second bottom is formed, the price increases significantly (even gaps up sometimes). The pattern is confirmed when the price breaks through the resistance, which is a horizontal level of the peak. One needs to be careful to distinguish resistance line from the trend line. The traders with higher risk appetite might take a long position once it breaks trend line – in this case, it is recommended to close the position at resistance and then open again once the real confirmation happens. Afterward, price tends to reverse back to the resistance which becomes a support. Double Bottom is medium to long-term pattern and thus a duration takes several months to develop. The time between the bottoms should be around 2-3 months. The volume tends to be higher on the sides of pattern and lower in the middle of the pattern. This is a fundamental theory that supports the selling and buying force. Steeper the left side of W is, steeper the right side can be expected and thus, higher profit once be getting the position right. The target price is obtained once the followed trend is broken. This tends to be the height of W from the bottom to the peak. The above chart shows Toyota Motor’s price declining since December 2016 until it hit its first bottom in April 2017. Then it reverses to form its peak and fall back to the same levels as the first low. The increased volume is visible in yellow circles. Once the second bottom had formed, the price gapped up twice and successfully rose to break the resistance. Double Bottom Reversal chart pattern is one of the most performing bullish patterns in the financial market. Every successful technician is aware of it and executes the trades accordingly.